Quan Am Buddhist Monastery and Temple and is located on the South side of the city of Memphis, TN. Conveniently located about 15 minutes from the Memphis International Airport, Quan Am Monastery is home to many devoted followers, and Buddhist Monks and Nuns. Call the Monastery at (901) 679-4528 to make arrangements for someone to show you around the Monastery grounds. Mahayana Buddhist Monastery and Temple practicing the Pure Land style in Memphis, Tennessee. The Buddhist Community of Memphis and Vicinity’s mission is to inspire humankind to respect our natural world, including people, animals, and all sentient beings. We train monks, nuns, and lay people and are dedicated to achieving world peace through following the Buddhist path. We are dedicated to preserving Mahayana Buddhism by creating opportunities to listen, reflect, meditate, practice and actualize the teachings of the Buddha. Visitors will find a warm, welcoming, friendly community which strives to exemplify Buddhist practice through service. Inspired by an appreciation of universal responsibility and service, we provide integrated holistic education whereby minds and hearts are transformed to their highest potential for the benefit of self and others. Realizing the richness of our Vietnamese heritage, we are very dedicated to passing along our culture and to sponsoring the growth and development of our youth. 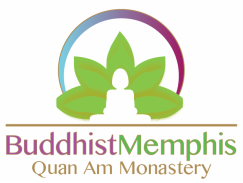 In addition, we seek to open our doors to people of all faiths and backgrounds, to strengthen the bond between Quan Am Buddhist Monastery and the Memphis community.